Sandy Walsh, RVT, CVPM, is a veterinary practice management consultant, instructor, speaker, and advisor with more than 30 years of in-the-trenches experience. Sandy still works in small animal practice and is dedicated to improving practice operations through coaching and sharing appropriate practice management techniques with the whole team. She is an active member of the Veterinary Hospital Managers Association, NAVTA, VetPartners, Sacramento Valley Veterinary Practice Managers Association, Sacramento Valley Veterinary Technician Association, and the California Veterinary Medical Association. She is also a Patterson Veterinary Management University instructor and a former California Veterinary Medical Board hospital inspector. FUN FACT: When she is not working in the veterinary profession, Sandy can be found playing with her dogs or building new habitats for her many rescued tortoises. 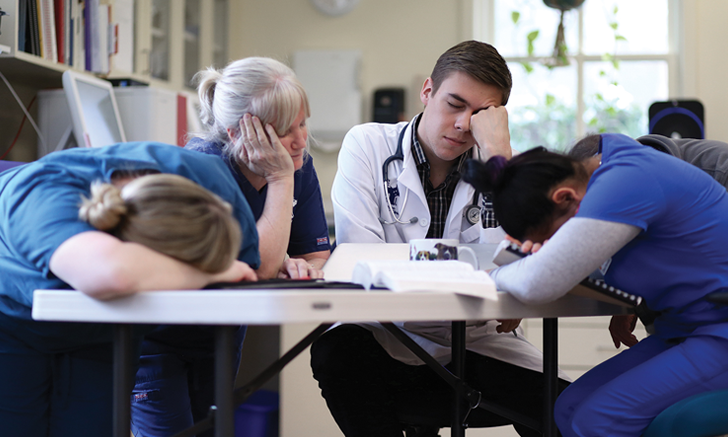 Team meetings can be challenging, and team members are typically less than enthusiastic about attending, perhaps because they think meetings are a waste of time and do not effect change—this is likely true if meetings are not organized and well-planned. Meetings can also be expensive when lost productivity and cost of labor, technology, and food are taken into account. Planning and managing effective meetings requires organization, communication, and listening skills. Meetings provide a great opportunity for team communication, sharing ideas, resolving issues, and setting future goals. Here are 6 tips, from the authors experience, that help get the most out of team meetings and make the best use of the practices time and money. Timing for team meetings should be carefully considered and be as consistent as possible (eg, every Wednesday at 1 pm). Choose a day and time that work best for the team and post a schedule for all meetings, allowing team members to plan schedules accordingly. Meetings can be held weekly or monthly, depending on the teams and the practices needs. The goal is to be able to meet for an hour without interruptions, so take steps to reduce or avoid distractions by closing the doors, sending phone calls to voicemail, and adjusting the appointment schedule. Clients understand the need for team education and will adjust when they are made aware of schedule restrictions in advance. Because team members already work long hours, be sure to avoid scheduling meetings outside normal business hours. 23% of WellMP associates and team members say improved communication would have the most significant positive impact on the practice; 69% say improved communication would increase their job satisfaction. Source: Benchmarks 2016: Study of Well-Managed Practices. Columbus, OH: WTA Veterinary Consultants & Advanstar Publishing; 2016:63-64. A well-organized agenda will help keep the meeting on track and ensure important issues are addressed. Give team members the opportunity to suggest agenda items in advance, which may encourage more productive conversations about issues. Team members will also be less likely to interrupt and attempt to introduce their topics. Plan to keep the agenda short and succinct to allow enough time to cover each relevant topic appropriately. Everything you need to cover in a regular team meeting can be addressed within the following agenda categories. It is important to make the agenda available a few days in advance of the meeting so team members have time to prepare and be engaged. A meeting facilitator is needed to keep the meeting on track, address pertinent issues, maintain momentum, and make sure everyone is heard. The role can be rotated between team members, but keep in mind that not everyone is comfortable running a meeting and some may not have the necessary skillset. Consider rotating other meeting responsibilities (eg, taking notes, coordinating refreshments, adjusting the schedule) to keep the whole team involved. Team members should know what to expect and what is expected of them at meetings. Ground rules and guidelines are essential. Start and end on time, insist on participation, maintain order, and resolve issues before moving on. Making a decision or developing an action plan and timeline for completion is necessary to reach a resolution. If steps are not taken to resolve the issues, they will come up again and again. Do not focus too heavily on specific department issues that do not apply to the whole team. Those issues are better addressed in a short department meeting in which participants are more likely to absorb information specific to them. Detailed meeting notes are an important part of meeting follow-up. Document any key decisions, action items, and timelines, and note who will be responsible for each task. This documentation provides the information needed to follow up with team members and make sure they understand the policy, procedure, or task at hand. Post or distribute meeting notes to all team members, especially those who were unable to attend. Recording the meeting can also be helpful. Keeping meetings productive and positive can be a struggle because difficult issues and topics often need to be addressed. The team should not walk away feeling discouraged. Consider the following steps to encourage positivity. Balance discussions of difficult issues with positive items. Focus on what is going right in the practice, in addition to discussing what is not working. Share success stories about clients, patients, team members, and finances. Always end the meeting on a positive note (eg, share client kudos, team member accomplishments, birthdays). Team meetings are an opportunity for owners to share their strategic goals for the practice with associates and team members. Good communication and sound financial management drive profitability and growth, according to study contributors Drs. Spencer Huebner and Carl Berg. “We schedule weekly meetings with managers, [veterinary] technicians, and receptionists. Yes, it is a huge investment of time, but constant communication cuts down on so many problems that otherwise end up using even more of your time. Plus, meetings keep everyone happier and improve the care of your patients,” says study contributor Dr. Brent Cook. Source: Benchmarks 2015: A Study of Well-Managed Practices. Columbus, OH: WTA Veterinary Consultants & Advanstar Publishing; 2015:90,95,99. Finding time for meetings that cover topics specific to different departments and teams (eg, management, veterinarians, practice owners) is also important. Having a plan for each meeting type is key to achieving success. Team meetings are used to discuss policies, protocols, events, and issues that impact everyone in the practice. Individual department meetings are an opportunity to cover specific issues and topics relating to that practice area and its team. If the team is small, this may not be necessary because most issues could be covered in the team meeting. Management meetings can be used to discuss management issues (eg, human resources policy changes, salaries, benefits, key performance indicators, client concerns, new initiatives). Veterinarian meetings are generally called to discuss medical issues (eg, case reviews, new equipment or product options, team member concerns). Practice owner meetings deal with major financial, facility, and future planning issues. The purpose of every meeting should be to solve problems, set goals, learn something, and make plans. Follow-up and follow-through are essential because a decision has no value if plans are not made to ensure implementation. Whether a meeting is for the complete team, a department, veterinarians, or owners, carve out time and commit to making meetings a treasure trove of information and not a waste of time. 2 Plan and organize meetings in advance, in great detail, to ensure team engagement and participation. 3 Do not involve the whole team in a meeting that affects only a specific department. 4 Always end meetings on a positive note.